Today, you’re going to hear two amazing stories on CBS News programs This Morning and Face the Nation—former US President George W. Bush will say that the Islamic State’s rise is his only regret about invading Iraq, and that he was surprised how now-deceased dictator Saddam Hussein remained in Iraq as a sign of disbelief that the US would invade the country. Let’s first dispense with the latter Bush-ism. One of Hussein’s last-hour offers to the US as a way to avoid an invasion was to allow US troops into the country to search for weapons of mass destruction, and to call for elections. The other offer called for Hussein leaving Iraq. Bush the Second said on February 22, 2003 that “[The US] will be in Baghdad by the end of March” regardless of Hussein’s offers. 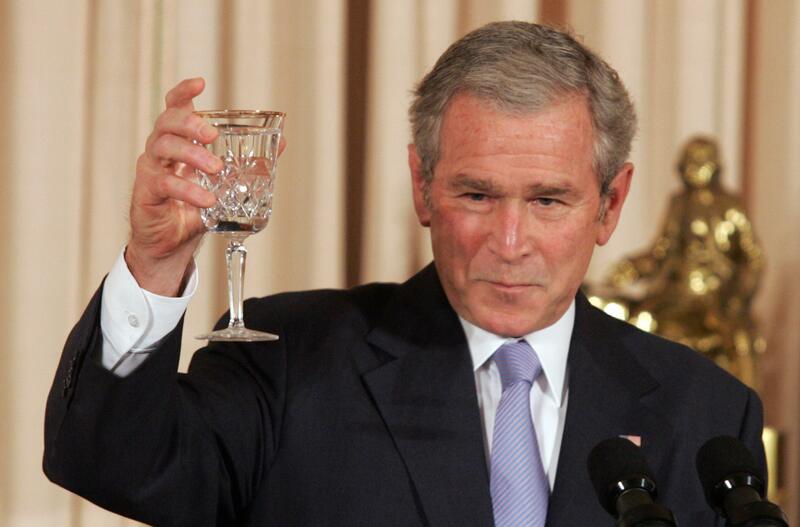 America invaded Iraq a month later. Next—and this should erase all ideas some of you may have about Bush the Second lacking the brains to understand right from wrong—more than half a million Iraqis were killed during Bush Junior’s invasion of the country. Some organizations place the estimated dead above one million. But the former President ran out of regrets to share…? This entry was posted in Politics, War and tagged bill clinton, George W Bush, gulf war, iraq, isil, islamic state, madeleine albright, shock and awe, wmd. Bookmark the permalink.